The Platinum Pets Low-Feeding Scroll Feeder features a classic scroll design to hold your lovable short-legged pet's favorite meal. The feeder is crafted with handforged wrought iron into a low scroll-shaped structure and powder coated in a FDA compliant gloss black finish. 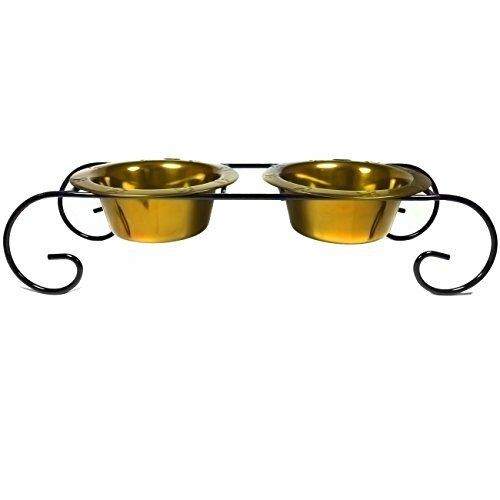 Your pet's meal will be held by two wide rimmed bowls tastefully embossed with paws. The bowls are dishwasher safe and powder coated in a multitude of foodsafe electric colors to guarantee against rust. Bowls are measured in fluid ounces and are rounded up to quart sizes.